Mr Tan and his wife, heavy with child, stepped into a maid agency to hire a maid 2 years ago. Being a first timer, Mr Tan was puzzled as to why he had to buy maid insurance in order to get a maid. The staff at the agency explained that it was a Government requirement to ensure that the maid was taken care of in case of an accident. The paperwork, including the application for maid insurance, was done in short order. Before long, the household grew by two new members – a little baby Calvin, and Lilian, their maid from Indonesia. Lilian has since become an essential part of Mr Tan’s household. She keeps his home clean and cooks up warm meals that sustain the family after a tiring day at work. Most importantly, she has been like a second mom to baby Calvin. Lilian has cared for the children of previous employers, and also brought up a daughter of her own. Mr Tan felt it was such a blessing to have an experienced helper. Lilian easily took care of scary tasks (for a newbie fathzer) such as feeding, bathing and even pooping the baby (fun fact: when you have a baby, one of the first things you ask when you arrive home is did he poop?). At night, Lilian would text her daughter back home. It made Mr Tan appreciate that Lilian not only takes care of his child, but has to provide for her daughter as well. If something were to happen to Lilian, who would take care of her daughter? This is where maid insurance comes in, to ensure that her medical costs are covered and her family is protected in case something unfortunate happens to her while working in Singapore. Put a Smile on Your Helper’s Face – with Maid Insurance? While insurance isn’t something you would normally associate with “putting a smile” on someone’s face, it actually is something that foreign maids here are thankful for. Maid insurance protects the welfare of our foreign maids. It helps employers ensure that they are able to foot the medical bills in case their maids require hospitalisation, and in the worst case scenario, the insurance pay-outs provide for the maids’ families. Purchasing maid insurance has been part and parcel of the process of getting a maid in Singapore since 2008. Over the years, the minimum sums that foreign maid insurance cover were increased to keep pace with increases in medical costs as well as increases in the cost of living in the countries our maids come from. BUT – It’s Not Just About the Money! Just because our maids have maid medical insurance coverage doesn’t mean we should overwork them. As good employers, we should allow our maids adequate rest and day-offs. For instance, under Mr Tan’s employment, Lilian gets a day off every month. Mr Tan also appreciates that looking after a toddler in addition to doing household chores is tiring and allows Lilian more rest time in the afternoons and evenings. Our maids’ mental and emotional wellbeing also need to be cared for. Non-Government Organisations (NGO) have also stepped up in this regard. For instance, Foreign Domestic Worker Association for Social Support and Training (FAST), organises Foreign Domestic Worker Day yearly to celebrate the contributions that our maids make. 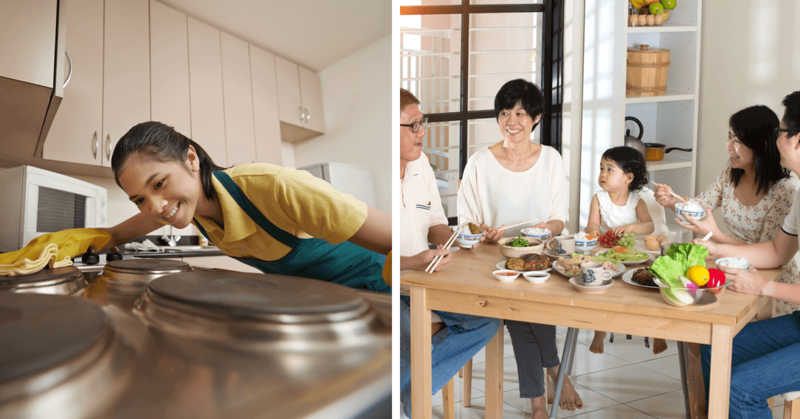 Other fun-filled events such as Hari Raya and Chinese New Year celebrations to make our maids feel included as part of Singapore society. The Annual Foreign Domestic Worker of the Year Award also shows our appreciation to our foreign maids. Do be supportive if your maid wishes to attend any of these activities. The latest change to the requirements for maid insurance came in October 2017, when the minimum maid insurance coverage was raised to $60,000. Coverage under Etiqa’s ePROTECT maid insurance plan has been enhanced to meet the Government’s new requirements. But don’t worry – Etiqa understands the pain that Singaporeans like Mr Tan feel from increases to the cost of living. To keep the ePROTECT maid insurance plan as affordable as possible, Etiqa brings to you the enhanced maid insurance coverage comes with no price hike! Many people may choose to just offload to their maid agencies the task of purchasing the maid insurance policy. While seemingly convenient, this may not yield the best deal. Why go through a middleman for a maid insurance plan if you can just buy it yourself? A good alternative then is simply surf over the Etiqa’s website, and buy the ePROTECT maid insurance online yourself. It’s simple and efficient. For additional savings, check out Etiqa’s Thank Etiqa It’s Friday (TEIF) page for maid insurance promotions. Whether you are about to purchase maid insurance for the first time, or have your foreign maid insurance renewed, show your maid you are thankful for them and that you care – choose Etiqa’s ePROTECT maid insurance. Protecting Singapore since 1961, Etiqa offers comprehensive insurance coverage and solutions with affordable and transparent insurance premiums. These include general insurance, life insurance, and maid insurance for personal and business needs. Etiqa is also one of the first insurance companies in Singapore to empower its customers with the option of online insurance. Etiqa is dynamic, progressive, and at the core of it all, committed to humanising insurance – placing people over policies.